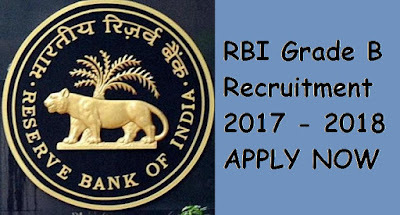 Candidates looking for RBI Grade B Recruitment 2017 - 2018 have a good news as RBI announced recruitment for Grade B Officers Post.Eligible and Interested candidates can apply online on or before 2018.Read the Complete article below for knowing more about the Age limit, Education Qualification, Application form, How to apply online and more details regarding RBI. For any Queries or Questions in mind feel free to ask below in comments. Candidates can also bookmark this website for more updates and latest notifications on Government jobs. Stay tuned for more Jobs according to your education Qualification and age limit. Checkout the article below and readout the details below. 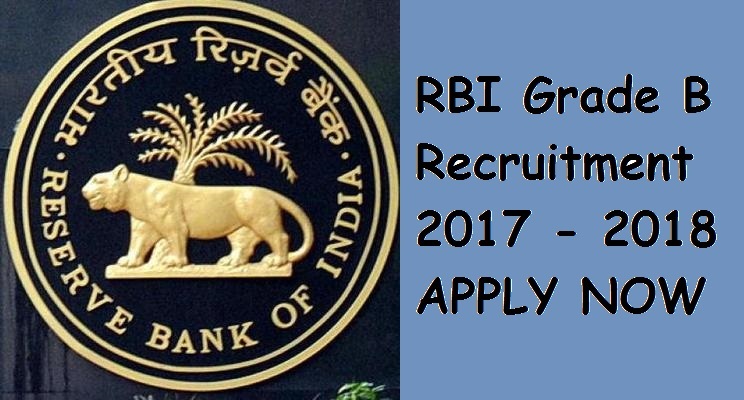 RBI finally announced the recruitment for the year 2017. Candidates who are interested and eligible can apply for the job. For details regarding Pay scale, education qualification, facilities, exam form details. As a huge number of people use banks daily and a lot of transactions takes place so we need more employees to ensure we give a proper service to our account holders. A person who can handle this work with patience, courage, honesty and Confidence may apply to serve for RBI Grade B officers. RBI jobs are most popular and most searchable jobs in India. Read the below information for TC Pay Scale, Exam Pattern, Eligibility and Apply online for the RBI Grade B Posts. As a huge number of people are using the facilities of banks. SO there is a huge demands for the people to work for the bank. So RBI has issued a notification for the recruitment. Candidates applying for RBI need to appear in the Prelims Exam conducted by the RBI. On the basis of clearing Pre they will allowed for Mains and Interviews. Phase-I online Examination (Objective Type): This will comprise a single Paper for 200 marks and will be held on June 17, 2017. Depending on the number of candidates, the examination may be held in multiple shifts and on some other days also. A candidate, however, has to appear for examination in only one shift on the given day. The date, time and venue on which a candidate has to appear for examination will be specified in the Admission Letter (AL) to be downloaded by the candidate. The ‘corrected-scores’ obtained by each of the candidates in different sessions (if held) will be normalized using equipercentile method. examination will be published on RBI web-site, tentatively within a week after Phase-I examination. (II) Phase-II online Examination: The Phase-II online Examination will be conducted on July 7, 2017, only for the candidates who are shortlisted on the basis of results of PhaseI. The Phase-II examination will be in shifts. Candidates are required to appear for all shifts. Separate Admission Letters will be issued for each shift. The time-table for Phase- Reserve Bank of India Services Board, Mumbai Advt. No. 5A/2016-17 Page 25 of 34 II will be intimated to the candidates concerned along with Admission Letter for Phase-II. How to Appy online for RBI ? Candidates are required to apply only online using the website www.rbi.org.in. No other means / mode of application will be accepted. Detailed instructions for filling up online applications are available at Appendix –I which is available on the Bank’s website www.rbi.org.in. The applicants are advised to submit only single application; however, if due to any unavoidable situation, if he/she submits another/multiple applications, then he/she must ensure that application with the higher Registration ID (RID) is complete in all respects like applicants’ details, examination centre, photograph, signature, fee etc. The applicants who are submitting multiple applications should note that only the last completed applications with higher RID shall be entertained by the Board and fee paid against one RID shall not be adjusted against any other RID.